Pizza made without grains, made without nut flour and made low carb! This pizza is also known as Fat Head Pizza! Pizza is one of the most guilty pleasures we indulge in when trying to watch our weight, lose weight or even just eat healthier. It tastes so bad for you and well…..usually it is. Loaded with hefty topping galore, one piece is never enough. 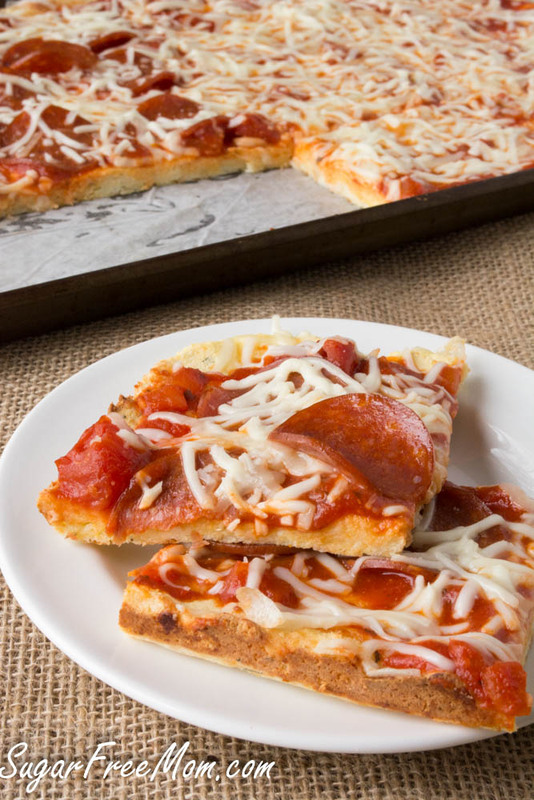 It’s never enough because traditional pizza is not made with healthful flours that would keep you full and satiated. Do you know anyone that can eat one piece of pizza? I’m not the first one to create this type of pizza but the original recipe, called Fat Head Pizza, contains nut flours I can’t use in my house as my youngest has a tree nut allergy. I also tried the original recipe with my adaptions to the nut flour and the amount was too small for a family of 5. I’m certainly not going to make a pizza all for myself! So I reinvented and worked on their recipe to make it work for us in our family. This way it is plenty big enough for everyone to have at least 2 pieces if they wished. 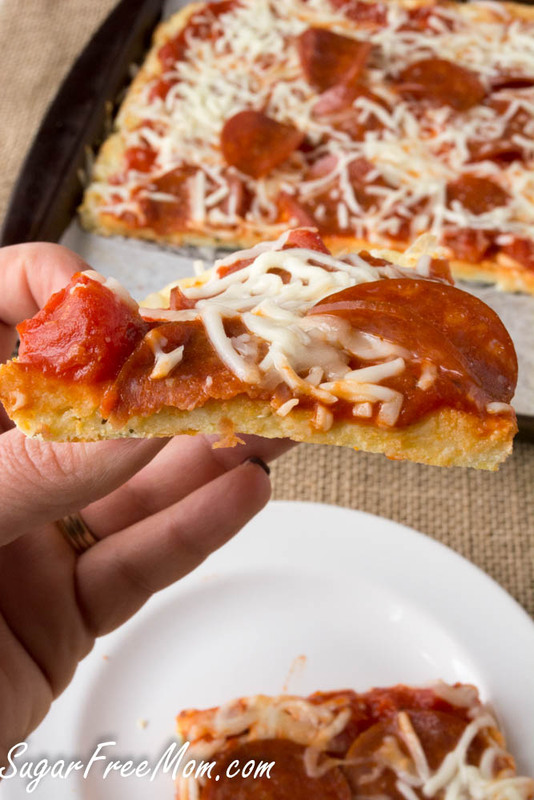 The most popular type of grain free pizza is the cauliflower pizza crust. And while I’ve tried that and I personally love it, my family could taste the difference. It was eaten but not something they would want on a weekly basis. With this pizza they could eat it weekly and not tire of it or complain. Why? Because it clearly resembles a real flour dough pizza! Unlike cauliflower crust pizza which is hard to hold and easier to just eat with a fork, this pizza can be held like a traditional piece of pizza. I did try to make this without parchment paper. I greased the pan and maybe it was my baking pan, but it did stick, which I hate. So parchment works. May not be as crispy on the bottom as you might like but it is what it is and it works for us. I’m just thrilled I can make a pizza my entire picky family will eat and it’s low carb and grain free and absolutely delicious! While we all ate 2 pieces, I decided to keep the nutrition information to one piece. You can decide for yourself if 2 pieces is worth the amount of carbs. UPDATE 2/21/16: After many requests to remove the tapioca, I successfully adapted this recipe to lower the carbs even further. The original recipe had just 3 cups of mozzarella cheese, 1/2 cup of tapioca flour and 2/3 cup coconut flour. I adjusted with much success and I’m happy to report and equally fabulous, nut free, grain free pizza dough! The change in nutrition info is much better! Original recipe had 10.4 grams carbs and 2.7 grams of fiber and the protein increased as well. UPDATE 9/2016: Some comments said it was a bit dry and hard to spread. I increased the mozzarella cheese by 1/2 cup which seemed to do the trick and made it nice and pliable. I also increased the time in the microwave from 1.5 minutes to 2 minutes making it much easier to mix together. Whisk flour and dried seasonings together. Wet your hands and spread mixture onto a parchment lined baking sheet or use a rolling pin between two pieces of parchment. For a thin crust, measure out a 12 x 16 rectangle. Spread as evenly as you can all the way to the edges of the pan, continue to wet your hands with water if necessary to prevent sticking. Using a fork make holes into the crust. Bake for 12 minutes or until slightly browned. Add your toppings and bake 5 more minutes to melt cheese. You’re a genius my dear!! 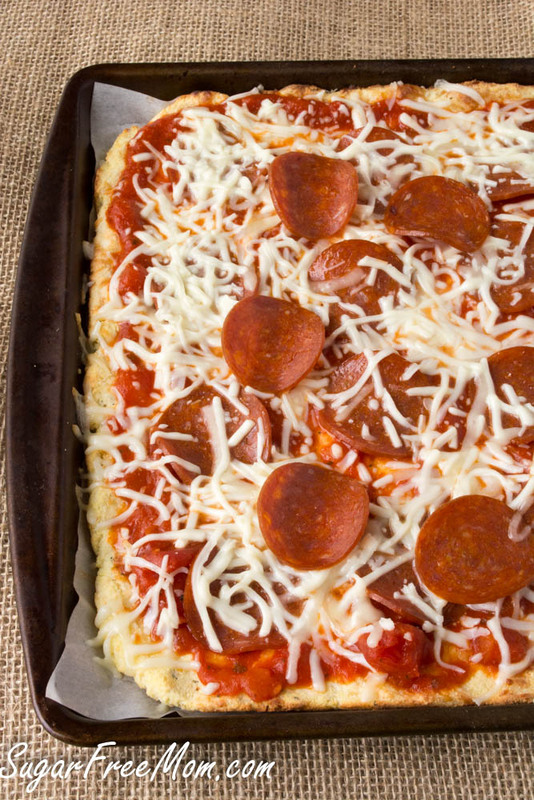 I’ve been craving pizza something fierce and I didn’t want the cauliflower version! Off to get the ingredients to try asap!! thank so much Leigh Anne! Please let me know how you like it! We are lacto vegetarians and do not consume eggs. I may want to try this using flax eggs? Also, hubby cannot have tapioca flour. Can I omit this? You could eliminate the tapioca but I would add another flour in it’s place. I hate to ask this, but where is tapioca flour in this recipe? I only saw coconut flour. Is something missing in this recipe list? Also, thank you, thank you for a good pizza recipe that is not cauliflower. I appreciate your work on this. There’s no tapioca flour in this recipe. Does this taste eggy at all? I can’t stand when I bake with coconut flour and have to use a lot of eggs because most of the time it is somewhat eggy and it grosses me out. There are a few coconut flour recipes I have made that aren’t eggy at all but more times than not, it’s eggy. How is this one? My family is pretty picky but they didn’t say anything about it tasting eggy. I wonder if there is a way to make the crust more crisp. Maybe flip the crust over and turn up the heat a little for a few more minutes???? I don’t know if that would work or not but just a thought I had. I’ll try that next time I make it. Hi! Do you know what’s the tapioca flour’s GI? It should be quite high as it’s starch from cassava root … I could not find it. Anyone? Tapioca flour is a super high carb starch. 🙁 If you’re trying to avoid blood sugar spikes, this is not the ingredient you want to use. There are similar recipes that don’t call for tapioca flour though! 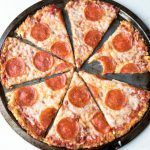 Try the original fat head pizza recipe! I would have used almond flour which can be subbed for it but my youngest has a tree nut allergy and I need to avoid it. The fat head pizza is made strictly with almond flour. Was watching a Dr Oz episode with a dietician and she served a bread with Tapioca flour that people said tasted really good. She also said that Tapioca flour is a resistant starch. I don’t know if that helps you. You could although I tried that and wasn’t happy with the texture. 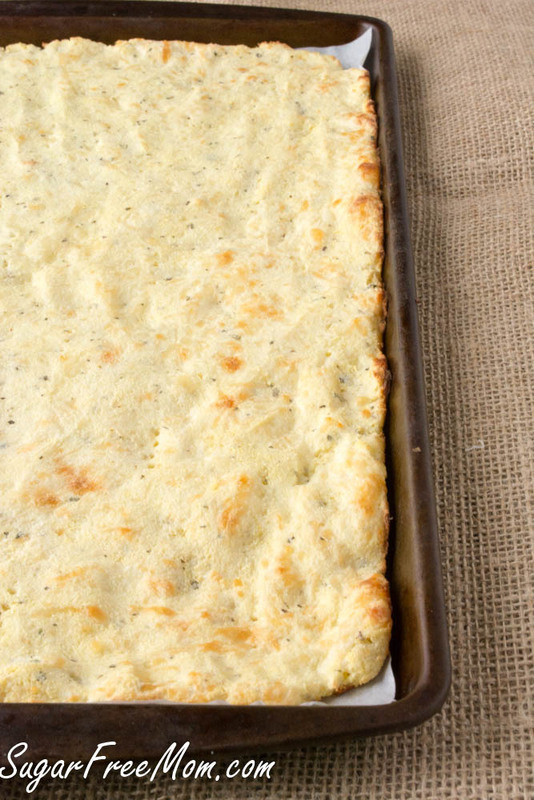 The tapioca makes the texture more chewy and resembles typical pizza dough. Would adding in some xantham gum do the same? How much would you add? I made this last night! I was so happy that it didn’t take a lot of time to prepare and this pizza was the best!!! THANK YOU SO MUCH!!! My husband loved it! he said it was so fresh! and he couldn’t believe the crust! so flavorful! I’m trying to lose weight and want to thank you for this awesome website. It’s become my staple, my go to site when I’m looking for something tasty but diet friendly. THANK YOU AGAIN!. Wow!! You were fast!!! How awesome! SO happy you all loved it! You say “add your toppings”… do I get to choose the toppings? Could you clarify this please…. thanks…. My nutritional information is for the recipe for the pizza crust only. Whatever you like on pizza is your toppings. We used tomato sauce, mozzarella cheese and pepperoni. Thank you. My allergist for my son has said that coconut is not a botanical nut; it is classified as a fruit, even though the Food and Drug Administration recognizes coconut as a tree nut. It is true. Coconut is not associated with nuts. It is a member of the the” drupes” family. Which is the fruit family. Have you tried this with any other varieties of cheese? I’m thinking cheddar. I am somewhat sensitive to dairy and for some reason my body seems to tolerate cheddar better than mozzarella. I know this would alter the flavor some, but I’m more concerned with the texture…. I tried this tonight and I LOVED it! I started eating pizza just a few years ago, and let’s just say I’m making up for lost time! This recipe is absolutely flawless. Thank you for putting so much thought into this recipe and going through trials and errors to produce and share such an amazing recipe! I recently discovered your website and I am hooked. Best wishes – Kathy. I appreciate your comment, thank you so much! I can’t tell how thick you rolled the crust. I was hoping to make mini sized pizzas for my toddler but didn’t know how thick the dough should be when rolled out? Also, can the crust be cooked and then frozen for later? DELICIOSO! 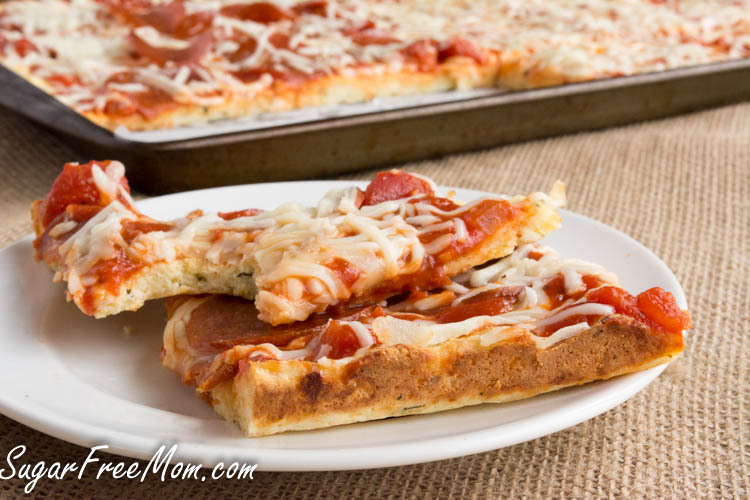 This pizza crust is so good! I used it to make the bacon cheeseburger calzone, which was awesome, and then made a super delicious pizza with the pizza crust recipe tonight! So good we all declared we would eat it for Friday night pizza instead of delivery anytime!! WOOT WOOT!! Awesome to hear thank you! I’m late to this post. But I’m wondering… Can you freeze this crust? Since going sugar free I sure do miss pizza. 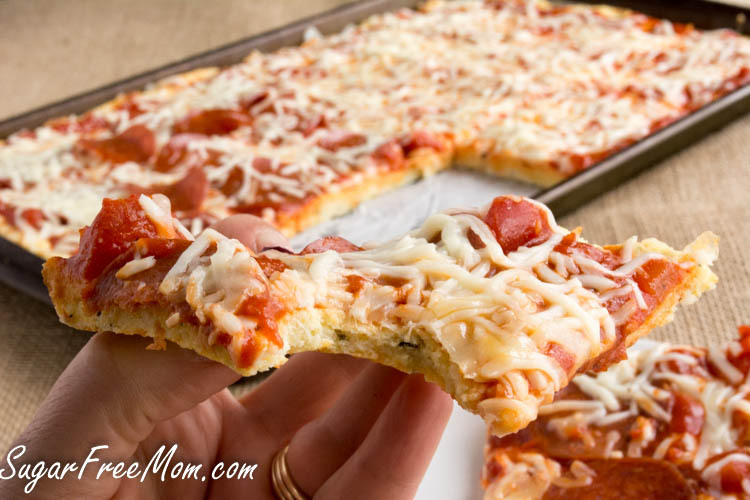 The idea of making a few of these crusts and freezing them for a super quick pizza fix sounds awesome. 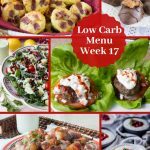 I love all your recipes ty for them as a diabetic type 2 i use these recipes alot i do however sub in qinoa and almond flour if the recipe calls for coconut flour which is high in sugar 16g per 100g serving. So if it calls for a cup i use 1/2 c almond 1/2c quinoa. Carbs do play a big part in a diabetics life as does the sugar…carbs turn into sugar. I found it so hard to stay on track because there didnt seem to be alot of food choices. You opened up my world of food again. 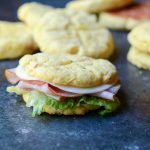 Ty for that..your cloud bread goes to work with me most days, i love that i can have a sandwich again guilt free, and know i am not hurting my sugar levels. Hmmm, I am not sure where you are getting that coconut flour information. My package for Bob’s Red Mill has 1 gram of sugar per 2 tablespoons. Even if it calls for 4 ounces or 8 tablespoons that is just 4 grams of sugar. 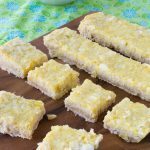 Maybe you are thinking of sweetened shredded coconut instead of coconut flour? This is what I use:http://www.iherb.com/Bob-s-Red-Mill-Organic-High-Fiber-Coconut-Flour-Gluten-Free-16-oz-453-g/10965 Needless to say do what works for you. My son is tree nut allergic so almond flour is not an option for us. 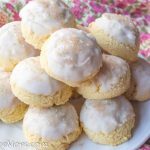 I made this recipe exactly as posted and LOVED it! I am so excited to try this recipe. 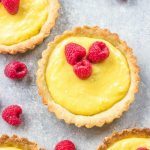 My husband just learned he is allergic to egg yokes,so would this recipe work with just the whites? I’m sorry I honestly don’t know since I’ve never tried that. This is the most fabulous thing ever on the face of the earth! Thank you so much! I halved the recipe since it’s just me and I didn’t have the onion or garlic powder so they didn’t go in. And I subbed Italian seasoning for the rest but oh that was just heavenly!! So disappointed to see a nut free recipe contain coconut flower. I have a tree nut allergy and coconut is a killer. Literally. Any ideas of a sub for it? My youngest has a tree nut allergy and the doctor told us that coconut is not in the tree nut family. It is actually a fruit. Some people are allergic to coconut as well, but technically speaking it is not a tree nut and my youngest can have it without issues. I have tree nut allergy and coconut is not included. I use coconut all the time. Looks good. Just like with regular fathead pizza dough, if you bake for a few mins, then flip and bake the other side, it’ll be crispier. I don’t have a microwave so have you tried to recreate the recipe without using the microwave? I’d love to know how to make this recipe without the use of a microwve. 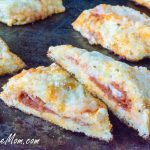 Simply melt the cheese and cream cheese over low heat in a sauce pan on the stove then continue with the recipe directions. Thank you! I can’t wait to make this for my kids! Can this dough be made ahead and either be frozen for later use or left in the fridge to use later in the week? If you can freeze it, do you pre-bake it or just freeze as a ball or pre-made crust shape? Thank you. I’d bake it first then freeze it and thaw when needed. This crust is so much more bread-like than the original fathead crust I am doing an experiment. Instead of the herbs in the recipe I mixed in poultry seasoning and ground sage (I left out the onion and garlic powders) after its baked I’ll cut into small cubes and dry them out in low heat oven and use the dried cubes for turkey stuffing following my old full carb recipe. Sure hope it works!! Just made this for dinner tonight for the first time! It was amazing! My husband even ate it and loved it….it’s a miracle! I am finally finding healthy food that he will eat. Thank you so much for sharing this recipe!! Can’t wait to try more of your recipes. OMGoodness this is a joke right? I mean 5 net carbs per little little piece. $ small ones is 20 net…bam out of ketosis. Id rather eat a regular one than to go through all this. If you’re in the induction phase, you have to watch eating tomatoes, asparagus, etc. this is something you’d eat after that for a treat. No one is telling you you have to eat it. It is provided for people that actually appreciate all of her hard work and efforts. Absolutely amazing! My new go to for bread substitute. 2nd time i used half the amount of coconut flour and the crust was perfect. Topped it off with spinach sauteed in roasted garlic and a bit of cream cheese. White pizza delivered by an angel! Thank you!!! 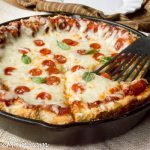 Would this work if you made it deep dish style crust? In a cast iron pan? I’m sure it could work, I’ve not tested it out though. I cut the recipe in half for a personal pizza. Kt worked out great! Thank you! Just finished eating some…it was delicious! Thanks for such an awesome recipe. I did one major substitution: I swapped out the eggs for flax eggs because I’d heard that fathead dough can be prone to tasting ‘eggy’…but my results were successful! I even made it deep dish style in a wax paper-lined 8×8 baking pan, though I might omit the paper and just oil the pan next time as the crust got stuck in some areas. I whipped up a quick pizza sauce and crowned my pizza with mozzarella, turkey smoked and breakfast sausage, ground beef, and turkey pepperoni. I am very pleased with my experiment and will make this again! Thank you! What does it mean by serving size 1g? Do you have to weigh it after baking? Or is it a certain inch size (like 1 in x 1 in)? No it was a glitch with my new recipe plug in, its just 1 slice. There are 12 servings. Oh my goodness!!! This dough alone is AMAZING!! Thank you! 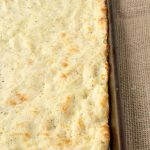 Im so confused, many of your comments are discussing tapioca flour, but I dont see it in the recipe and one of the replies actually said there isnt any in the recipe. However, further down, another poster asked if anyone had tried just coconut flour and the reply stated that you werent happy with the texture. Can you help me to understand? Thanks! Please read the UPDATES written above the video stating many requests from the orginial to replace the tapioca flour. Got it 😉 Now I understand, I would have gotten that if the comments I read led back to that point. Thanks a bunch for your quick reply! Cant wait to try it! Been looking for a Fathead recipe w/coconut flour instead of almond. Yaaaaaaay! PS I halfed the recipe and sub’d 2 tablespoons of coconut flour with oat fiber flour (6 Tbl coconut flour + 2 Oat flour) and I added 1/2 tsp baking powder and they came out excellent! 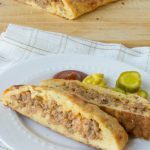 I used the recipe to make stuffed breakfast rolls and they were amazing! Thanks for the recipe! Yes same amount of eggs, the only changes were what I mentioned in the updates above the recipe. This recipe turned out great. My wife is picky about pizza crust and she really liked it. Is there any way to make it crispy? 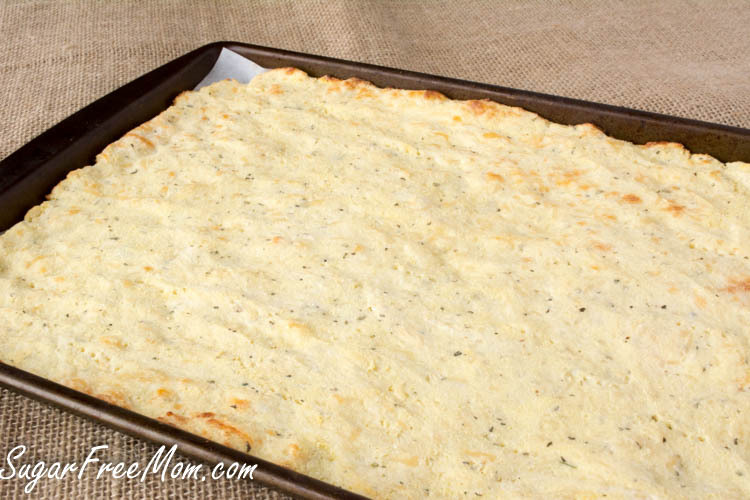 I’ve tried it without the parchment paper, but you need a really good like new baking pan so it doesn’t stick and yes it will get crispy. I love this crust! 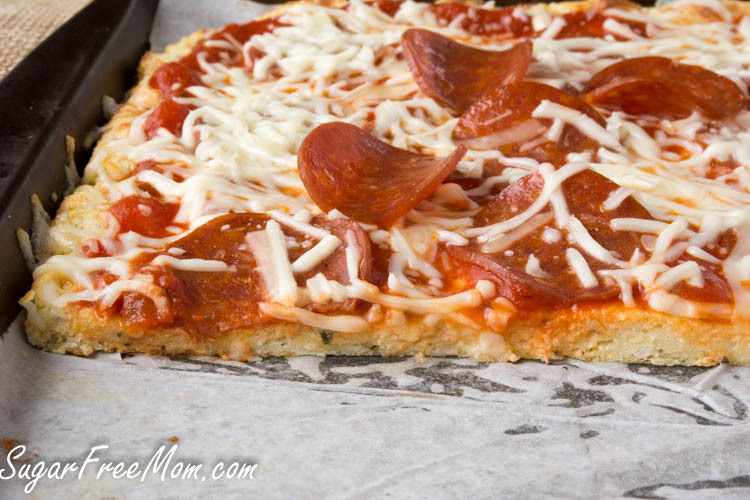 Again, my husband is so picky about diet/healthy recipes AND Pizza crust, and he loves the texture of this crust. Very versatile and easy. My husband is allergic to coconut so is coconut flour the same? Is there a sub for the coconut flour? Is the garbanzo bean flour measured the same? If he’s a allergic to coconut then he shouldn’t have coconut flour. I’ve not tried garbanzo bean flour since it isn’t low carb. I’d suggest just looking for a low carb pizza made with almond flour. Made this tonight. Did not like it at all. Very dry crust and didn’t taste good. Family did not like either. I just made this pizza again I use Gouda cheese. And it works well. Only this time I didn’t the fat head dough. I thirst mixed little blocks of cheese and schreef er coconut very fine. Then added the rest and mixed a minute or two until it wa thick. I spread that even on a baking sheet and baked it until it was turning in golden brown and put the topping on of and baked a few more minutes. It tasted great so if you need a shortcut it is possible. OH yum! So going to make this today for a quick lunch or supper . 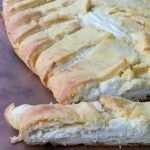 Tried this recipe last weekend and it was awesome! I’m thinking about modifying it a little to make taco pizza. Use taco seasoning instead of Italian seasoning and maybe subbing either cheddar or pepper Jack in for part of the mozzarella. Have you tried putting different cheeses in it? No I haven’t tried anything other than mozzarella, let me know if you try something else and how it goes. I did your recipe x 1.5 and did the half with sharp cheddar and it turned out awesome! Recipe says mix mozzarella and cream cheese. How much mozzarella so I know how much to keep aside for topping? Thank you! Cant wait to try! All of it, I did not include any amount for toppings in this recipe, it was only ingredients for the pizza crust. I have been holding on to this recipe for the last two weeks and today, decided to go for it. I am so glad I did! Not only was it delicious but I already have started planning on using it for calzones and maybe even garlic knots! As an added bonus, I had family show up for a surprise visit tonight and they brought a couple of pizza pies for the family. I went right to the fridge, grabbed one of these slices and heated it up. Then I sat with my family and was able to enjoy pizza with them completely guilt-free! Thank you so much for this recipe. It’s definitely a keeper!